I had slept about three hours in The Schoolhouse Bothy. The wind was incredibly loud and rain lashed at the windows. The wind was so strong against the West-facing wall I really thought it might blow down on me. So halfway through the night I moved to the smaller central room to sleep. It was much better. By 9am, it was still raining heavily in showers. I was ready to go but thought I would wait for this shower to end. I have learnt some of the weather patterns here. Luckily I was correct and the rain stopped once after ten minutes. It was a bit of a grey day but not too bad. By the time I got to Oykel Bridge the day suddenly opened up into a glorious blue skies. I actually shouted with joy. It was fantastic. This made this day really enjoyable and I slowed my pace to a moderate speed. It had been appalling weather for the past few days. On my way past Oykel Bridge, which had some impressive stone arch bridges I went onward up the track which took me along the river. I passed a small farmstead which had a cattle shed. 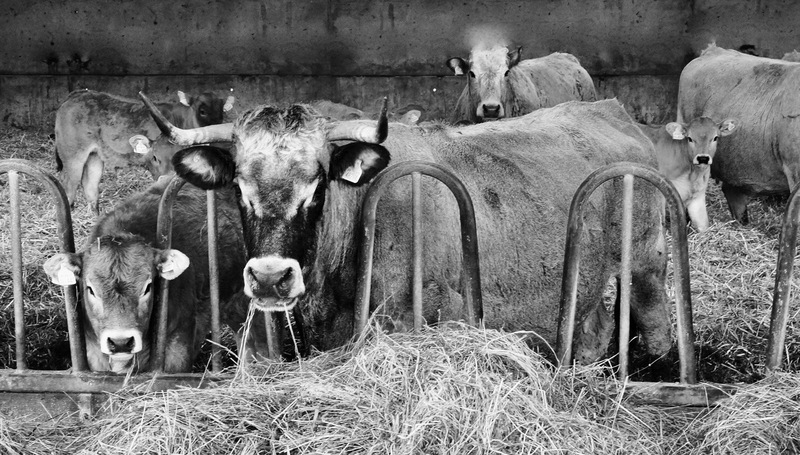 The cattle, like the deer and sheep seemed intrigued about my presence but cautious, I try and make friends but they soon trotted off to another part of the shed. I was following the oykel river which is a beautiful, wide salmon river. In Autumn, the Salmon make their way up this watercourse to breed and lay eggs. This was a very popular spot with Anglers. The riverside had little fishing seats and fishing huts. Some where unlocked which means I could have slept in one if the weather was truly bad. But it wasn’t. I actually stopped for lunch here. I hadn’t done this for the whole trip. It was nice to simply rest and eat by the river watching the water flow past. I took my boots and socks off to air. 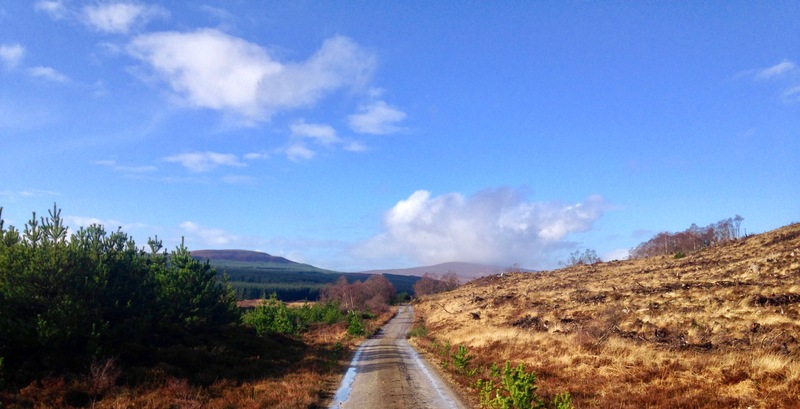 It was one of the turning points in the trip where I decided to slow down, convince myself that this was not a race and that I should savour the better weather when it came. My walk had turned into a stroll, and I spent the afternoon along the riverside not even looking at the map. Eventually, I caught sight of a very pretty burn that led into the forest. I heard bird song here, and for some reason I felt enticed to enter the forest and alleviate myself from the path. I followed a little burn up. After only a short stroll I saw the gable end of a ramshackle house tucked away in the woodland. Excitedly, I hopped over the trickling burn and tip toed over to the house gently. I half expected someone to still live here – maybe a little old hermit. Tucked away in the woods, I was immediately transported into the storybooks of my childhood. But I wandered quietly to the front door to find it wide open, litter strewn inside and the upstairs floor completely caved in from damp. 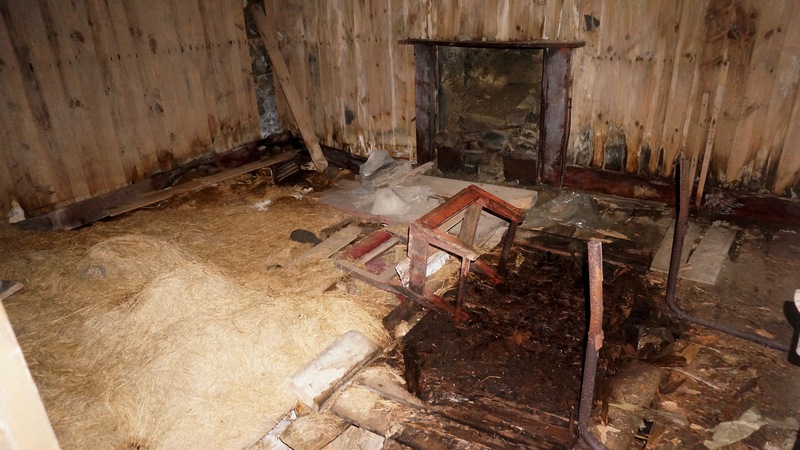 Inside was a broken chair, a fireplace and a bed of hay, which felt like someone may have slept there at some point. It was not a Bothy anymore, barely a hovel. At either end of the broken home were roofless parts – possible barns or stores. It was the typical “longhouse” design of a croft. 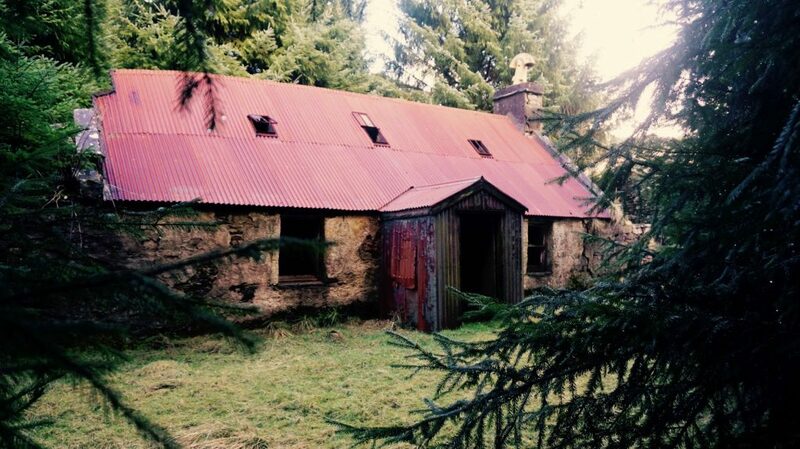 Most of the bothies around here were almost identical in their plan, possibly built by the same person. It was an idyllic and fairy-tale spot. Quiet, with soft grass, bird song and protective trees. It’s overgrowness added to its mystery. I did find it on the map, it was marked simply as “Salachy”. It was probably once a croft. The tree plantation has since enveloped it. It would have been built sometime after the highland clearances. The highland clearances happened because rich Landlords decided their tenant farmers didn’t make them enough profit. Sheep farming was now the new way to make money. And so many farms and communities were raized or burnt to the ground, tenants where threatened and evicted. Entire forests were chopped down and the indigenous people of the highlands were replaced with sheep. Many of these people sought new lives in Canada. Which was a new territory, and is directly West across the Atlantic. The sad irony is, after all the clearances, the sheep farming industry simply flopped. It was not that profitable after all. Many landlords abandoned their estates. Some went bankrupt. And in some rare cases in the twentieth century, the communities that were once evicted returned and bought the estates using community buy-out schemes. Many Crofts still survive as ruins from this era. They add the to drama of the landscape. Many of these places were left to ruin. But there are some that have survived and even been restored. In the 1960s a volunteer group known as the “Mountain Bothy Association” began approaching estate owners with a simple plan: they would offer to renovate these structures for free, using volunteer work parties – in return these places can be used as refuge and enjoyment of walkers. This arrangement is still maintained. And bothies have become places of pilgrimage for many adventurers. This wee croft was a little reminder of past times and I felt a little sad that it had both survived so long, and yet was now a hidden, abandoned place. I was excited to find it though, purely by following my curiosity. We shared a moment and I left on to continue my journey. I left the riverside to pass through a large expanse of felled plantation and heavy plant vehicles. But it was only for a moment, as soon as I rounded the Glen More Loch I saw the most amazing double rainbow of my life. With bright blue skies behind me, rain in front and sunshine piercing through it, this was the effect. 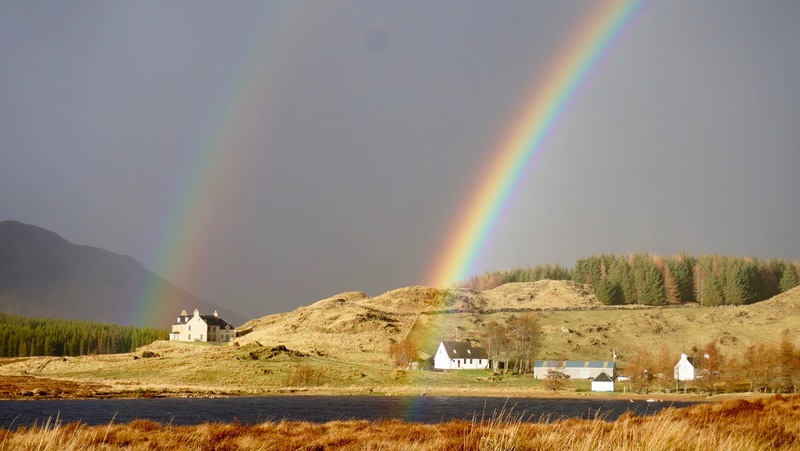 I rounded the Loch to Glen More Lodge (the apparent source of the second rainbow). I spent some time here looking for a decent campsite as the path is kettled between the river and steep wooded hill. I explored the hill and to my surprise caught a fox by surprise. He was sitting atop of the mound enjoying the landscape. I stood behind him for a good two minutes before he registered my presence. I decided, in the end, after a lengthy scout to camp in an unsheltered position next to the river. It was flat and dry, but in the morning I would be weather beaten.